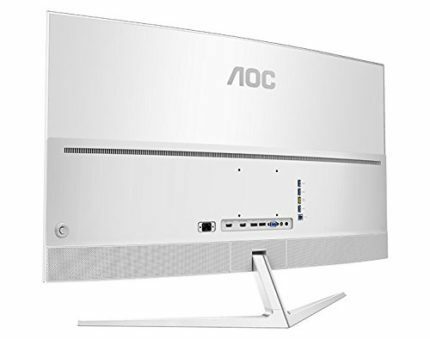 AOC has recently made the AOC C4008VU8 monitor available for purchase. At the moment (April 2017), it goes for only $800. This giant 40-inch screen boasts the 4K UHD resolution, 10-bit color depth and a deep 1800R curvature for a stunningly immersive viewing experience no matter the activity on the screen. Alas, as it offers only 60Hz refresh rate, it’s certainly not suited for fast-paced video games, although saying that you wouldn’t be able to use it as a gaming monitor and have a blast is not nearly true. The AOC C4008VU8 features an SVA panel with a superior contrast ratio, impeccable 178-degree viewing angles, and accurate colors. Although the 10-bit color depth panel covers 85% of the NTSC color gamut (84% Adobe RGB), it’s still not suitable as a monitor for the professional color-critical work. The IPS panel monitors are the absolute choice when it comes to color accuracy and consistency. 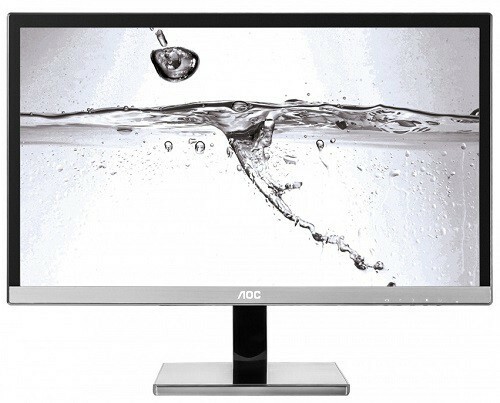 Besides, the AOC C4008VU8 display has a curved screen which can negatively affect some professional work. 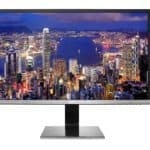 Another factor that may repulse professionals is the low pixel density; even though the monitor features 4K resolution, on a 40-inch screen that results in a mediocre 101 pixel per inch which is lesser than the 1440p resolution on a 27-inch monitor. While the pixel density isn’t sufficient for professional work, it’s more than enough for a remarkably immersive and vibrant image quality of any multimedia content. With 1.07 billion colors and the superior contrast ratio of the VA panel, you might even neglect the drawbacks of the monitor for gaming. Sure, it may not have adaptive-sync or high refresh rate, and the fast moving objects in the fast-paced video games may cause blurring due to the 5ms response time, but if you were to run a more detail-oriented non-competitive video game, you would without a doubt be blown away by the image quality. The AOC C4008VU8 PC monitor doesn’t use PWM (Pulse Width Modulation) to adjust brightness, so the screen is flicker-free which allows you to enjoy the viewing experience for hours without eye fatigue. Furthermore, the monitor comes with the standard AOC iMenu and e-Saver software. The former allows you to adjust all the OSD settings in a desktop application rather than by the OSD buttons while the e-Saver software offers you the ability to manage power saving and auto shut-down options with custom timers. The design of the AOC C4008VU8 consists of a simplistic yet modern appearance with a white/silver cabinet and thin bezels. The ergonomics include 100 x 100mm VESA mount compatibility and tilting option by around -5, 14 degrees. The connector ports include two DisplayPort, one HDMI 1.4, one HDMI 2.0, both of which support MHL for content streaming from your mobile device, a VGA, and four USB 3.0 ports, one of which has the fast charging capacity. Additionally, there is an audio line-out port as well as an audio line-in for the 2x5W built-in speakers. At the moment (May 2017), the AOC C4008VU8 display is available for $800 which is a nice investment for an awesome everyday monitor even though it cannot be used for the professional color-critical work nor is it recommended for fast-paced video gaming. 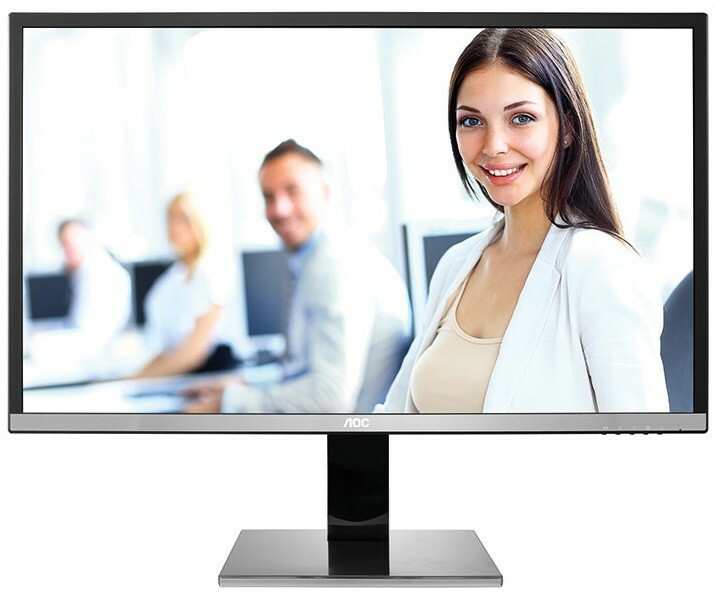 However, considering the monitor’s main intent – a big screen with a great image quality for the all-purpose multimedia experience, it’s available for an appealing price. The AOC C4008VU8 is a giant and stylish monitor that offers everything one might need for an immersive viewing experience regardless of the activity on the screen. 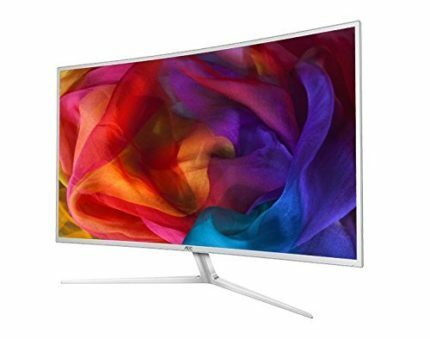 Whether it’s casual gaming, movie watching, or just web surfing, the monitor will deliver a brilliant image quality due to high pixel density (considering the screen size) and the VA panel with high contrast ratio and 10-bit color depth. Moreover, the narrow bezel design and the deep curve make the picture simply pop out which also makes the monitor ideal for multi-display setups. The AOC C4008VU8 is a gigantic 40-inch screen with a crisp and sharp image quality due to the 4K UHD resolution. Moreover, the high contrast ratio of the VA panel and the 10-bit color depth greatly contribute to the vibrancy of the picture. Overall, it’s a reasonably priced big-sized monitor for a complete multimedia enjoyment with no flaws.